Fort Lauderdale Pier 66 Where Are You? Pier 66 Where Are You? Pier 66 means different things to different people depending on whether they are new to Florida or have been around a few years. My Pier 66 is a tall hotel on the Intracoastal Waterway in Fort Lauderdale. It was built in the 1950's and was originally owned by the Phillips Petroleum Company, the sellers of Phillips 66 gasoline. There was a Philips 66 gas station in front of the hotel back in the fifties and sixties. It's easy for me to remember the date of my first visit to Pier 66. It was June 6, 1966, or 6-6-66. Pier 66 had a revolving lounge on it's top floor named Top Of The Pier that was open to the public. Spectacular views of the Atlantic Ocean, Intracoastal Waterway, Port Everglades and downtown Fort Lauderdale were available from this slowing revolving lounge. As I recall, the elevator took 66 seconds to rise from the ground to the lounge floor. The lounge itself rotated once every 66 minutes. I could drink 3 Dewars and water per revolution. It was important during such periods of libation to memorize where your table was when you left it to go to the restroom. When you returned, the table would be in a different location. The last time I visited Pier 66 was in early 2005. The hotel was by now a Hyatt, and had been remodeled for probably the umpteenth time. I met a friend for a drink and to enjoy the spectacular sunset as I had done dozens of times before. As the sun descended below the horizon, the lights of Port Everglades and downtown Fort Lauderdale were twinkling decorations on a golden backdrop of green palms and blue canals. 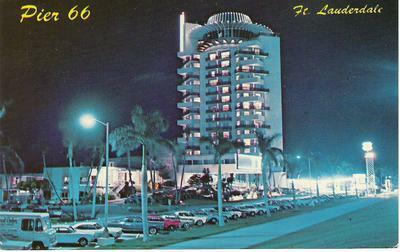 The following month I was in Fort Lauderdale and went into the hotel for my habitual trip to the Top Of The Pier. I learned that it had been closed to the public and to hotel guests. It is now only available for private parties. Another chapter in Old Florida that is sadly closed. I think if one follows the money, there were probably too many tourists and sightseers using the lounge. Not enough of us 3 drink per revolution types to make it work economically. The picture above is of the Pier 66 tower taken from the parking lot of the adjacent marina. This is a great landmark. What is the current hotel that has now taken the place of the Phillips 66 property? Is there actually a hotel today in 2019? It is still a hotel called Pier 66 Hotel and Marina. I don't know if it is affiliated with a larger chain; it may be independently owned and operated. My father worked for Phillips & we went to Pier 66 every summer in the 1960's. It was & still is one of my favorite hotels. 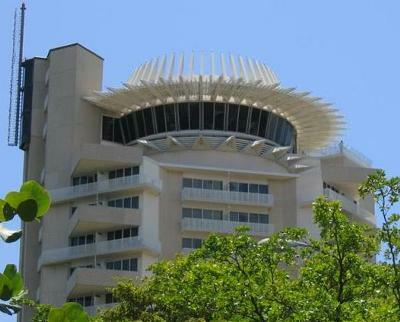 I miss the revolving restaurant, but the rest of it is still great! We lived on Lake Sylvia as kids back in the 60's. My brother got a telescope for his birthday, and he discovered that he could see Pier 66 - clearly. So, one afternoon, he was watching the top go around, and saw someone on the revolving points of the tower. They swan dived into the putting green below, that was the last time he ever used his telescope. Prior to the tower being constructed, there was a large time and temperature sign out front(I'll never forget the morning I drove by and the temperature registered 29 degrees). Just to the east of the main entrance was a par 3 golf course and the tennis courts. My dad began working for Pier 66 when it opened. He was accounting manager (I think that was his title). We spent hurricane Betsy hunkered down there. I spent many hours in that hotel and remember so many wonderful things about it. Thanks for this article. Thanks, Glenda. That must have been something to ride out a Hurricane at Pier 66. I just checked my history and Hurricane Betsy was in 1965. We were living in a shack at the University of Florida back then and had to evacuate to an approved shelter. It's good to hear they are open for brunch on Sunday. I thought they were totally closed to the public and only available for private parties. I think I will make the trip over there soon one Sunday. Does anybody know if the top of Pier 66 is still closed to the public?